This is a temporary cover for WORTH THE WAIT. The final cover will be very similar with a few of the smaller images swapped out for others. The book is 128 pages and hard cover. It is on sale now for $25 and will be available on Opening Day. Buy it now at www.sfgiantsbook.com. Ever since I graduated from San Jose State University with a degree in photojournalism back in 1988 I have had the amazing opportunity to witness so many historical sporting events because of my cameras. I have taken millions of pictures at so many big events, including Super Bowls, the NBA Finals, the Olympics, and the World Series. Since I am a baseball guy the World Series has always been my favorite event to cover, and I have photographed 14 of them- that last 11 in a row. Most people know that I am a huge San Francisco Giants fan, so having the chance to photograph my team winning their first World Series Championship since they moved here from New York in 1958 was an unbelievable experience back in November of 2010. Did that really happen? When I flew home from Dallas the morning after the Giants defeated the Texas Rangers in Game 5 to clinch the title I was exhausted, both mentally and physically. It had been a crazy and emotional roller coaster watching the Giants on television some of the time and photographing their games in person most of the time. It wasn’t too many days after I got home that I started texting my good friend and amazing writer Brian Murphy. Murph had been in Texas covering the Series for his morning radio show on the Giants flagship station KNBR and we had talked excitedly about the history we were witnessing many times during that glorious weekend in Arlington. Murph and I are both local Bay Area kids who grew up rooting for the orange and black. We were Giants season ticket partners with a large group of friends. We both covered the team as members of the media. “We need to do a book,” I texted Murph. I told them that as Giants fans with unique jobs that could paint an amazing picture in both words and pictures it was our duty to share our experiences with Giants fans everywhere. There would never be a better time to collaborate on a book about the Giants. We began serious discussions, and once I called my friend and amazing agent Amy Rennert things began to move at a rapid pace. Amy had worked with the Giants on a large book project in the past that I was a small part of called Splash Hit. Amy was familiar with my work and with Murph so she was on board to help us find a publisher. On Saturday, November 13, 2010 Murph and I sat down at his dining room table and cranked out a book proposal. Within weeks we had several publishers interested in the project and it looked like this thing might really happen. 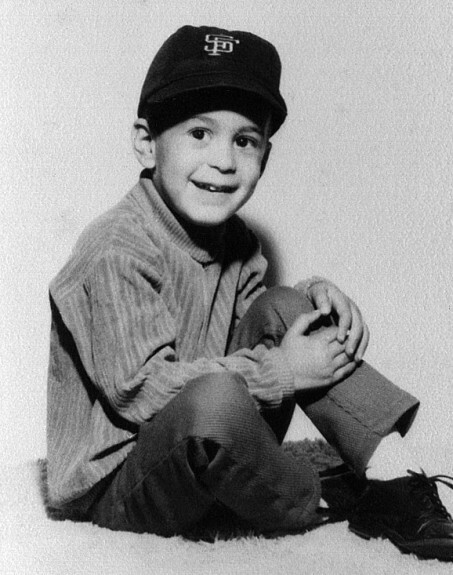 Brad Mangin is pictured here as a three-year-old Giants fan proudly wearing his Giants cap in 1968. I have the unique perspective of having photographed about 50 Giants games in 2010 from spring training in Scottsdale through the final out of the World Series in Arlington. In between I have witnessed many highs and many lows. All of these moments help document a long season of baseball, and when you put all of my photographs together with the writing of Brian Murphy we can tell a pretty good story. We started having discussions with our friends at the Giants, including Senior Vice President, Corporate Marketing Mario Alioto. Besides being a Giants bat boy during the Jack Clark era Mario is a cool guy who thought it would be a good idea for all of us to work together to create the official Giants book of the magical 2010 season. This would be an amazing opportunity. We joined forces with book editor Scott Gummer and his friends over at Luxury Custom Publishing and have been working extremely hard ever since to get this book to the printer and ready for all the fans to enjoy by Opening Day in two short months. The name of the book is “Worth The Wait.” I like the title- especially since I came up with it (who says photographers can’t help out on the word side every once in awhile?). Joining Murph and I in the book will be Giants ace closer Brian Wilson. Wilson will be writing the Forward for the book, and Mike Krukow and Duane Kuiper will be doing the Introduction for us. We are very fortunate to have a terrifically talented designer putting this book together named Nate Beale. I have seen the designs he has created for the interior of the book and they are amazing. This book is going to have a very special look to it, and I am so proud that my pictures from the 2010 season will be presented in such a beautiful way. The Giants officially put the book up for sale online yesterday morning. You can find the book on the Giants website sfgiants.com or over at mlb.com. 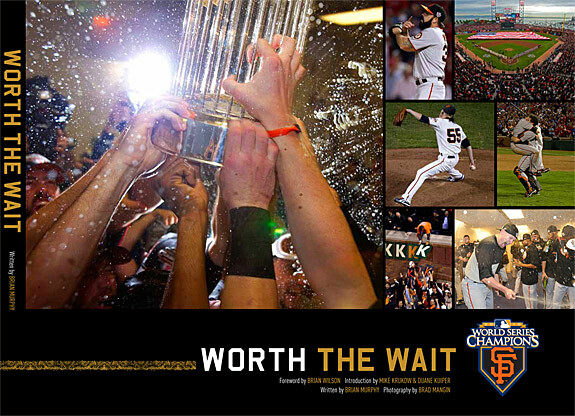 However, the coolest way to order the book is to simply go to sfgiantsbook.com. We will all be working very hard over the next few weeks to finish putting the book together, writing captions, and making it as cool as it can be. I have learned so much during the process of putting this book together. I have never had a book that featured so many of my photographs. I have never had my name on the cover of the book as the photographer (most of the pictures in the book, about 95% will be mine). Having to go back-and-forth so many times on contract language has been an eye opening experience. None of this would have ever happened without the tireless work of our agent Amy Rennert. She has guided Murph and I through this entire process so gracefully. She is tenacious. She will not take no for an answer. I owe so much to her. I will never forget what she has done to make all of this possible. If you would like to meet some of the people behind the book, like Murph, Scott and myself be sure to look for us next weekend at the 18th Annual KNBR 680 Giants Fan Fest at AT&T Park on Saturday, February 5, 2011 from 11am till 3pm. We will have a special booth set up to promote the book and take orders. See you there! Brad, this is awesome, man. Congratulations. The photo of you as a little boy really adds to the accomplishment. What a great story! Thanks for sharing. Brad, This is incredible! Congratulations, this is quite an accomplishment. I cannot wait to see the finished product and to add it to my library. One thing though ….. who knew you were a Giants fan? You always seemed to be at Yankee Stadium in October I just assumed you were a Yankee fan. Thanks for the kind words and thanks for letting my guys win one. You can now go back and win several more. I will be happy for awhile. Brad, the picture of you at three is adorable! I’m so happy that your dream has come true. Well deserved, too. I can’t wait for “Worth the Wait”. I just picked up your book and love it! As an avid photographer, Giants fan and father to a 4 year old it was a joy to read on so many levels. We turned to page 33 and my son yells “Buster Posey!” I disappointed him when I wouldn’t let him sleep with it tonight. One of my favorite photos is on page 52, that still really tells a story! Nice book! We’ll probably wear it out. Thanks so much Rick! So glad you and your son are enjoying the book! I am lucky that I had the chance to photograph the team last season like I have for over 20 years. Today was a fun one out there. I am waiting for another book signing. I want you and Brian to sign one of my favorites – next to the picture of Willie McCovey’s statue. I wrote the only review of your book at the Barnes and Noble website. Thanks so much for the kind words Cindy! I am so glad you like the book. We are doing a signing at the San Jose Giants game next Friday night June 24 and at Book Passage in Corte Madera on July 28. I am Rod Campbell’s Mom and Terry Smiths Mom in law. I have 2 books to be signed, and need to buy 4 more books. Will you have books for sale in San Jose on the 24th? What time is the signing and is it at Municipal Stadium? I THINK the signing starts at 5- that is when the gates open. Game starts at 7pm and that is when we will stop. I am waiting to officially hear. YES- books will be for sale.